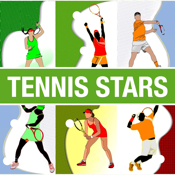 Tennis Stars iPhone app with you! All tennis players in the world rankings and has been in practice you will find the legend. You can find pictures of individual stars of tennis in this application. You can have detailed information about the lives of Tennis Stars. You can follow the news on the world of tennis. Receive and share information through the pages of the fan comments about the stars.